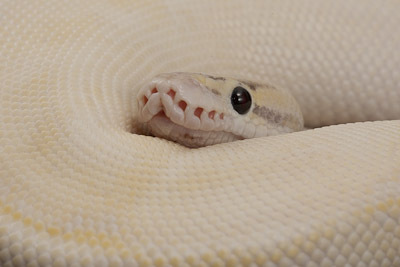 Genetics can be extremely complex and confusing.� With all the new morphs and the upcoming designer morph possibilities, a basic understanding of genetics and how it relates to breeding is essential.� First there needs to be a basic understanding of some of the terms that are used in genetics. DNA � deoxyribonucleic acid.� The molecule whose structure forms the genetic code. Chromosome � Each cell in every living thing has a nucleus.�Much of the nucleus is made up of a constant number of paired chromosomes.�Each chromosome is a single, long strand of DNA in a protein matrix.� The strand of DNA contains many genes. Gene � the units of DNA that are transmitted from one generation to the next in the sperm and egg cells.� Each gene codes for a specific enzyme.� Each enzyme catalyses one step in the biochemical pathway that determines an individual�s phenotype. Allele � one of two or more alternative forms a gene may take.� A homozygous wild type allele, together with wild type alleles at all other loci, produces a normal individual.� A changed, or mutant, allele at one locus can block or divert a biochemical pathway to produce a phenotype that is different from the normal. Locus (plural = loci) � the location on a chromosome where a specific gene resides.� Think of it as a street address. Genotype � the genetic make up of a plant or animal.� The identity of an allele or alleles that a single individual has at one or more specified loci. Phenotype � the physical appearance of the animal as dictated by the genes it has inherited and the influences of the environment. Heterozygous � having two different alleles at a given locus. Homozygous � having two identical alleles at a given locus. Wild type � normal.� The phenotype most commonly seen in wild caught individuals.� The allele at each locus that produces the wild type phenotype. Recessive � a mutant allele that changes the phenotype only when in the homozygous.� When heterozygous, the individual looks normal. Codominant � a mutant allele that changes the phenotype when either homozygous or heterozygous.� A heterozygous individual does not look like a homozygous individual, and neither does it look like a normal. Dominant � a mutant allele that changes the phenotype when either homozygous or heterozygous.� A heterozygous individual looks like a homozygous individual. Double Heterozygous � heterozygous at two gene loci. Triple Heterozygous � heterozygous at three gene loci. P generation � two unlike individuals that begin a genetics experiment, or breeding program. F1 generation � first filial generation.� The offspring of the P generation.� An F1 is a single member of the F1 generation. F2 generation � second filial generation.� The offspring of two F1s. F3 generation � third filial generation.� The offspring of two F2s. Punnett Square � a learning tool for determining the possible outcomes of a given cross between individuals.� It was developed by R.C. Punnett, an early British geneticist. Some of the names that are used to describe various color and pattern mutations are rather long.� For example, the name �Lavender albino� contains 14 letters.� Using the entire word when filling in a Punnett Square would make for an enormous Punnett Square.� Abbreviations of the names are used instead of the entire name describing the mutation.� Mendel originated some of the rules used for symbolizing today. The symbol is a unique one to four letter abbreviation of the mutant name.� For example, a could be used for albino. �As a is already taken, ax could be used for axanthic. All characters in a recessive mutant�s symbol are lower case.� Again, a is for albino, a recessive mutation. All characters in a dominant or codominant mutant�s symbol are lower case, except for the first letter, which is upper case.� For example, Ti could stand for tiger, a codominant mutant in the reticulated python. The symbol of the locus is the same as the symbol for the first mutant gene found at that locus.� For example, a stands for both the albino mutant gene and the albino�s locus.� Ti stands for both the tiger mutant gene and the tiger�s locus. The symbol of the wild type or normal allele at each locus is the locus symbol followed by a plus sign as a superscript.� For example, the wild type allele at the a locus would be a+.� The wild type allele at the Ti locus would be Ti+.� If usage is clear, the wild type allele can be symbolized by a plus sign alone. As genes come in pairs, there are two alleles in a genotype.� The two symbols may be separated by two slash marks (//), particularly in complicated genotypes.� While useful, the slash marks are optional.� For example, an albino individual could be symbolized either a//a or aa.� A heterozygous tiger could be either Ti//Ti+ or TiTi+. The more dominant allele goes on the left side of the genotype and the more recessive allele goes on the right side of the genotype. Always remember to clearly label all the symbols used in your Punnett Squares. Setting up your Punnett squares. In most cells, the chromosomes come in pairs.� During the development of the gametes (sperm and egg cells), the chromosome pairs separate.� Half of the chromosomes will go to one gamete and the other half will go to another gamete. For the following example we will use a breeding between an albino and a normal, or albino x normal.� The albino is represented by aa and the normal, wild type, is represented by a+a+.� The cross is written aa x a+a+.� The two possible gametes from one parent are listed across the top of the Punnett Square and the two possible gametes from the other parent are listed down the side of the Punnett Square.� When setting up the square each allele needs to be placed over or next to it�s corresponding box. 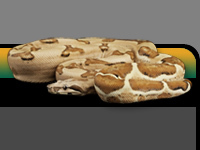 Remember there are two alleles for each trait.� Hence aa for albino.� In a normal ball python the albino allele is not present, only the wild type allele.� This allele is indicated through using a+a+.� Once everything is in place, the square can be completed.� The letters on the left are brought across to the squares that are in their row.� The letters on the top are brought down and placed beside the letters in their columns. 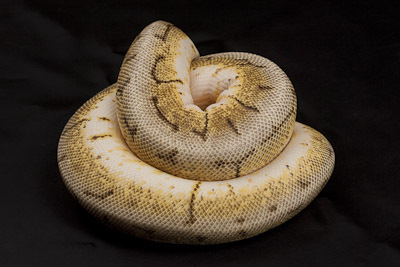 The resulting offspring are all heterozygous for the albino trait, however they all look like normal ball pythons.� Ball pythons that are heterozygous for a recessive mutant gene display the normal phenotype. Before proceeding further with examples of different potential crosses a brief discussion of odds is in order.� When a Punnett Square is completed it illustrates perfect results, however many clutches do not hatch out with perfect results.� The Punnett Square is a guide to possible results, not a guarantee of results.� A cross between an albino and a heterozygous albino should result in 50% of the hatchlings being albino and the other 50% being heterozygous for albino, however this is an ideal ratio.� A clutch consisting of 6 eggs hatched out 5 albinos and one heterozygous albino.� On the other hand a clutch consisting of 5 eggs hatched out 1 albino and four heterozygous albinos.� In one instance one clutch hatched out more albinos than expected and the other clutch hatched out less.� It is also important to remember that the odds apply to each egg in the clutch.� Many times the odds are applied to the clutch as a whole, instead of to each egg individually.� Please keep this in mind when your clutches hatch.